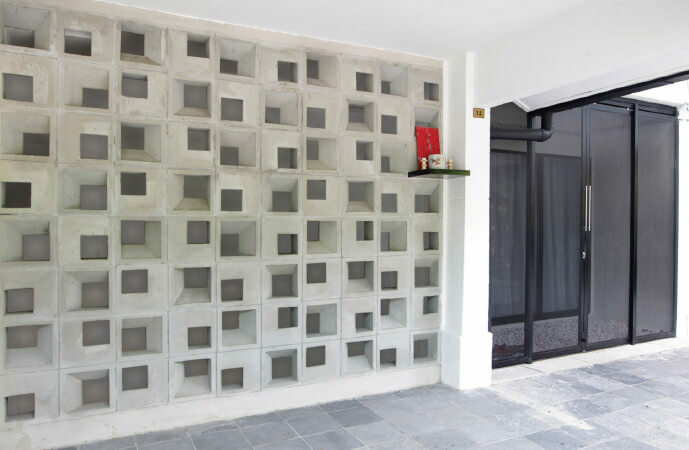 A facade of cement breezeblocks and sliding diffused metal entrance doors create an unassuming front porch. Hacking through the floor and placing a steel mesh void between the floors gives the workstation area a high ceiling and added ventilation to both floors. 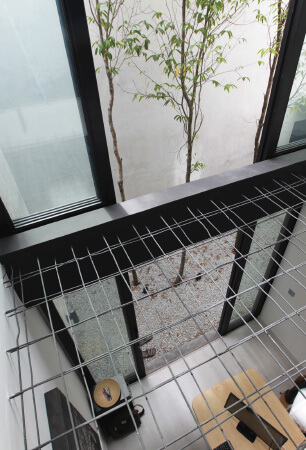 Erecting a double-storey wall creates an enclosed back garden with a tall gaharu tree. The tall double-storey doors also allow for ventilation and sunlight to enter downstairs and upstairs at the same time. The house has an overall open plan allowing for a seamless flow from one section to the other. The entrance into the house starts from the living room and flows to the workstation and kitchen areas in the back. 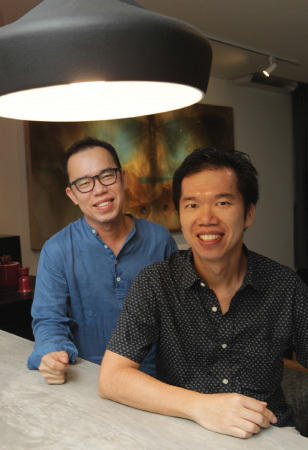 Homeowner Tan Chun Siong’s (right) only requirement for his architect and younger brother Tan Chun Hooi is a workstation area, but Chun Hooi added elements to the terraced house, giving it a luxurious bungalow feel. The perforated metal semi-transparent storage area opened up the floor plan giving the illusion of more space, while Chun Siong’s contemporary art collection finished the look. It is barely mid-morning and we are already squinting against the glare of the sun while keeping our eyes peeled for the house we’re looking for. It is easy to miss because the rows of terraced units in Taman Bukit Kinrara, Kuala Lumpur, all look the same. Finally, we see it, wedged right in the middle of a row facing a main road. The front porch is unassuming enough to disappear into the neighbours’ clutter of overgrown weeds, litter and other eyesores. You would not guess that a step past the façade of cement breezeblocks and sliding diffused metal entrance would take you into an oasis of cleanliness, openness and space pervasive enough to forget the natural chaos outside. What initially was meant to be just a place for homeowner Tan Chun Siong to sleep has now turned into his dream home — an ideal new-old home so convenient and comfortable that he rarely feels the need to leave. “It’s changed and improved my lifestyle. I prefer to stay at home more now,” says Chun Siong, who, for the past five years, has commuted between his family home in Alor Setar every weekend, while living alone in Kuala Lumpur during the week. In his brief to Tan Chun Hooi of Design Gallery Sdn Bhd, he asked for only one thing — a pleasant workstation downstairs, knowing the architect/interior designer would get it right. And he was right. Chun Hooi was the driving force behind the transformation of the house, the added benefit is that he is Chun Siong’s younger brother. Given that terraced houses may be a cornerstone of suburban Malaysian living but their architecture doesn’t hit all these points. Culturally, due to the shared walls, terraced home living sometimes leads to a lack of privacy and a habit of cramming too much into a small space. Environmentally, Malaysia gets a lot of harsh sunlight causing spaces to uncomfortably heat up and socially, brings the additional anxiety of security. 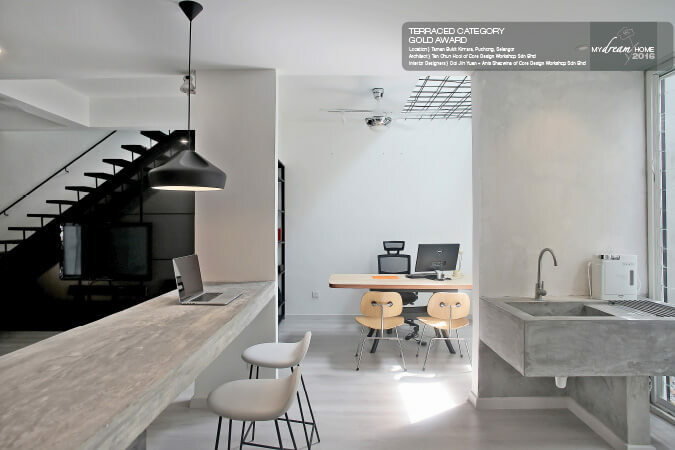 The usual layout of a terraced house is predictable with four bedrooms and three bathrooms, but Chun Hooi chose to sacrifice the additional rooms for open spaces, resulting in two bedrooms and bathrooms, all of which are located on the top floor. Step inside the house, and you’re greeted with a regal tabletop Buddha statue by the kitchen bar and two impressive pyrography art pieces on the living room walls. Flowing from the living room is the open plan kitchen to the right and Chun Siong’s home office to the left, finished with the private garden next to the workstation and a toilet with a half wall looking out into the garden, accessible from the kitchen. The stairs to the top floor are immediately to the left of the entrance, with a storage area underneath, also with perforated metal material to keep it semi-transparent, but also allowing for the flow of the open plan to roam. Chun Hooi further explains: “It wasn’t going to be a typical extension of the house, but more of utilising the space creatively to create a comfortable living environment.” Most plans to deviate from uniform terraced houses often go down the route of extending rooms and pushing back walls, but Chun Hooi decided to go vertical by erecting a double-storey wall and creating an enclosed private garden in the back with a gaharu tree (a Malaysian rainforest jungle tree) right by the workstation. Looking up from the workstation is a steel mesh void, complementing the double-storey wall. By hacking through the top floor, it created a double-volume airwell which allows for cross ventilation and gives the workstation area a high ceiling as well as opening up the upstairs living space. “We have very harsh daylight in Malaysia, we want daylight but it’s too hot and can be damaging,” says Chun Hooi adding that the double-storey light well has also cut the daylight harshness to a much more comfortable and subtle level. “My purpose was to have natural ventilation downstairs and upstairs at the same time,” adds Chun Hooi, pointing out a key factor that the air on the top floor would be deadlocked if the doors upstairs and downstairs weren’t opened at the same time. Getting the doors made was one of their biggest challenges, despite such tall door frames being done before, it has not been done in such a slender frame. Instead of a bedroom, Chun Hooi created a laundry area, so daily chores can be done overlooking the back garden. “Now there’s a lot of daylight for the house, for both downstairs and upstairs. It gives privacy and security at the same time and it’s comfortable – we can afford to have the doors and windows open without grills,” says Chun Hooi. “He can keep the doors open at night and not worry, unless you’re Tom Cruise,” he says, with a laugh. 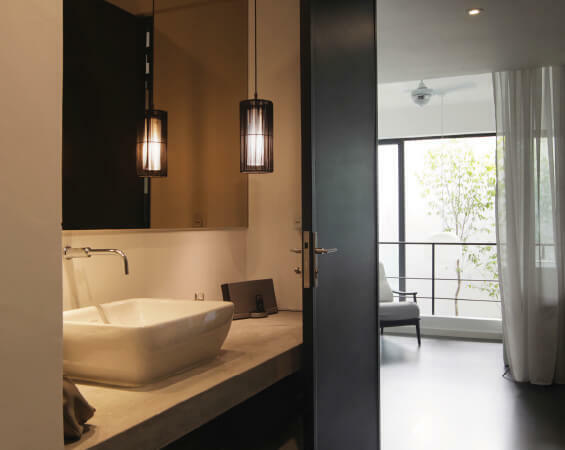 Finally, the master bedroom is where minimalist and subtle touches are added to give a luxe bungalow touch, such as separating the washbasin area from the shower. Having to creatively work around the budget, the master bedroom was reorganised with a free-standing wardrobe made with perforated metal. Environmentally, the house has some challenges as it faces west — this was fixed with a perforated metal grill as a screen in the master bedroom and a mini balcony to filter the harsh sunlight. While the space feels luxurious, Chun Hooi shares that it didn’t seem logical to blow a big budget on this project, as the house itself wasn’t valued at a very high price. Adding to the luxe factor were also the contemporary art pieces already owned by Chun Siong. 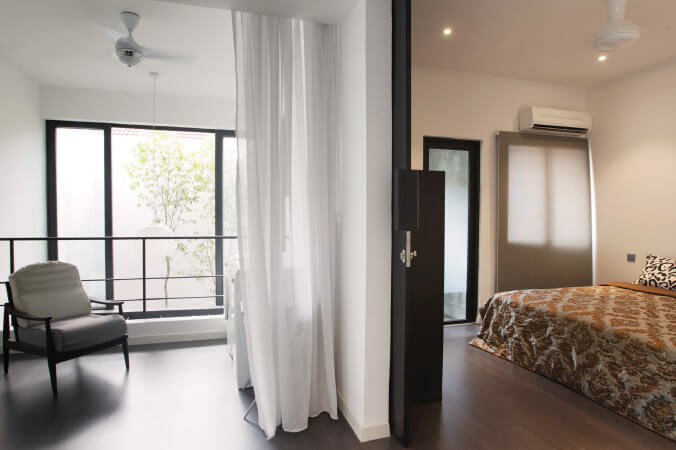 “It’s luxury in terms of the spatial quality – the whole atmosphere of the house changes,” muses Chun Hooi, adding that while the house isn’t at an exclusive snazzy address, the cozy quarters have managed to achieve an atmosphere reminiscent of an expansive bungalow.